The Dallas Opera’s production of Carmen not only kicked off a new season, it also launched a new era for the company with newly-appointed music director, Emmanuel Villaume, leading both the orchestra and production. In his debut, Villaume put a unique stamp on this well-known story of power. Though seemingly a simple story of jealousy taken too far, Carmen is a reflection of the Parisian power struggles around the time of its 1875 premiere. Emmanuel Villaume and stage director, Chris Alexander, guide the audience in this larger power-pull as well as the inner struggles of the characters through the use of “light” and “dark” on stage. The production opens with the brightly lit Plaza scene and the bright dress of the blond, pure Micaëla; performed fantastically by soprano, Mary Dunleavy. Dunleavy serves as the perfect contrast to Carmen and her gypsy camp throughout the work as her crisp, soaring high range seems to be showing Don José the “light” he should have followed (as his mother told him). The scene immediately darkens as we are taken to the tobacco factory to first meet Carmen. It is within the first act that Villaume portrays the character of Carmen as being the obvious power-broker within the work. Mezzo-soprano, Clémentine Margaine uses her dark, warm tone to bring out a sultry, rather than flirtatious, element in the character, letting the audience know she is in control of all the men drooling over her. Act two opens in a Tavern scene and once again Villaume brings us Carmen as the person in power; she scoffs the advances of other men, even the great Toreador, Escamillo (Dwayne Croft). After Croft’s — who brought a nice, round baritone voice to the Toreador role, though it was tough to judge him due to an announced illness he was singing through — rendition of the famous Votre Toast aria, it is clear that Carmen has chosen Don José; her defining choice. Don José’s entrance into the tavern was again a study on how the production wanted to use lighting to show his turn from the hapless soldier to the maddened, gypsy “deserter,” as Don José enters to a brighter scene and exits to a darkened tavern before the curtains close. Brandon Jovanovich as Don José brought perhaps the best voice to the stage (perhaps only second to Mary Dunleavy as Micaëla), with a powerful tenor that rang out over even the most powerful parts of Bizet’s fantastic score. He easily melded his voice throughout the performance to match his fellow singers whether it was the bright Dunleavy or the darker Margaine, and his phrasing always seemed to be in touch with Villaume’s direction of the orchestra. 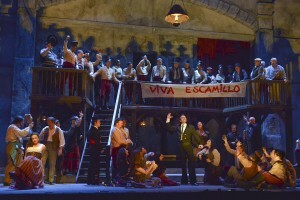 The third act might have been the only hitch in the performance as it seemed Villaume was attempting to show the audience that Carmen had lost her power and was no longer in control. The transition, though seemingly setup some by the darkness that began to grow around Don José in Act Two, was a bit jarring. Don José immediately becomes more of an abusive, jealous character, and Carmen seems to have become a woman that can be tossed around by any of the men around her — though her attention is suddenly cast on Escamillo, who is able to make Carmen do whatever he wants. All of this a startling contrast, especially when we get to the famous “Card Trio” with the wonderful Danielle Pastin and Audrey Babcock as Frasquita and Mercédès. 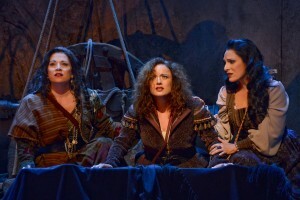 The trio begins with wonderful comic relief of the dreams of Babcock and Pastin’s characters and is followed by Carmen’s realization that if she is going to truly be free, it might cost her the ultimate sacrifice. Luckily the trio seems to right the ship and leads us back into the final act where we see Carmen back in power before she shouts the motto “Live Free and Die Free” before her bitter end. Overall, it was a great opening for the new music director, Emmanuel Villaume, as he led all of the singers through grand performances and allowed the orchestra to be the star of the show when appropriate. It’s perhaps the first time in awhile that there was an uproarious applause after an opening act overture (though who can resist the famous Prelude? ); an applause echoed at the end of the production as the house was dimming the lights before the audience was done with their standing ovations for the performers and the new Dallas leader.